Monolithic perovskite catalyst LaMnO3 was manufactured and tested for activity in the oxidation of selected volatile organic compounds. Tests were conducted in a quartz cross-ﬂow reactor for the space velocity equal to 10 000 h-1 and the concentration of each oxidized compound – 1 g/m3. Prepared catalyst showed high activity in the oxidation of oxy-derivatives – ethanol and acetone, and aliphatic hydrocarbon – n-heptane, lower in the oxidation of ethyl acetate. The lowest activity of catalyst was found for aromatic hydrocarbons oxidation – toluene and xylenes. The conducted research allowed one to determine characteristic values for ﬂowing liquid ﬁlms. That made it possible to calculate the average thicknesses of occurring liquid ﬁlms, determine phases void fractions and each liquid phases dominance in the flow and showed that the applied method of measuring the conductivity of liquid – liquid system can constitute an important tool to identify the structures in two-phase liquid ﬂow. Experimental studies dealing with the effect of outlet shape on discharge coefﬁcient and relation of discharge coefficient vs. Reynolds number are presented in the paper. The largest values of discharge coefficient were obtained for a profiled outlet of the atomizer. It was shown that the orifice length to diameter ratio did not affect the value of discharge coefficient. 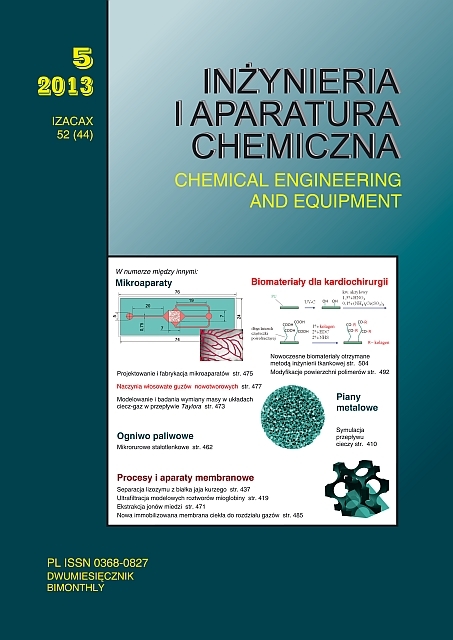 Research results dealing with the effect of distance between two impellers mounted on the common shaft on mixing power in water − oil 20-30 and water − oil 20-70 systems, and the minimal agitator speed needed for emulsiﬁcation are presented in the paper. It is shown that the minimal agitator speed depends on the distance between two impellers and a type of agitators. It was stated that mixing power depends on a type of agitators used. Mixing power achieved the biggest value for the system of 2RT impellers. The apparatus for the production of carbonaceous adsorbents from different precursors, especially natural raw materials are presented in the paper. The construction and operation conditions of apparatus were described and the results of iodine (LJ) and methylene (LM) numbers’ determination were presented. To evaluate the porosity of obtained carbonizates the mercury porosimetry method was used. The results of investigations and tests showed that carbonization products can be used in the production of meso- and macroporous carbonaceous adsorbents. The paper presents the results of computer simulation of water flow through FeCrAlY alloy foam (FEC). Simulations were carried out in the flow area limited to a representative elementary volume of foam (REV). It was found that even at the significant simplification of foam structure geometry the hydrodynamic phenomena in cellular foam were properly reﬂected. Pressure drop values determined by numerical calculations differ from the measured ones only by a few percent. The velocity distribution and a course of its pathway achieved in simulation allow one to specify the conditions for changing flow nature from laminar to turbulent. Results of comparative calculations dealing with the application of momentum method are presented in the paper. Hereby two different size distributions models based on the normal distribution and the Gaudin-Melloy distribution are used for the reconstruction of particle size distribution. The paper presents investigation results dealing with the fabrication of silver and copper nanoparticles in the microwave assisted flow process. The synthesis were carried out with application of ethylene glycol as reducer, AgNO3 , AgOAc and Cu(OAc)2 as precursors of nanoparticles and polyvinylpirrolidone K-30 as stabilizer of colloids. It was found a crucial inﬂuence of process temperature and precursor type on a ﬁnal size of prepared nanoparticles. Analysis of possible use of plate heat exchangers in the industrial air evaporative cooling system is presented in the paper. The selected elements of numerical algorithm calculations with the results for conducted experimental research conditions are given. The comparison between experimental and calculated results was made showing a high accuracy. Exploitation conditions of the installation are discussed and possibility of its optimization is indicated. protein concentration 0.005%. Experiments were conducted in the ﬁeld of polar molecular modeling in order to determine the size, shape and electrostatic properties of the analyzed protein. Membrane distillation process was utilized for the concentration of 1,3-propanediol solutions resulting in the retention of alcohol in retentate by more than 99.6%. Long-term studies of the concentration carried out for over 600 h had demonstrated a good resistance to wettability of used polypropylene Accurel PP membranes. The separation of fermentation broths by ultrafiltration and nanoﬁltration integrated processes was investigated. The glycerol fermentation was carried out using Lactobacillus casei bacteria. During the UF process the solutions were clarified obtaining turbidity of 0.1 NTU. The NF process allowed one to remove a majority of salts present in broth. The application of NF270 and NF90 membranes enabled one to obtain a partial separation of organic compounds formed during the fermentation process. Influence of atomization method on the stability of liposomes being a novel carrier of inhalation medicines was studied. Measuring the droplet size and concentration of encapsulated tracer allowed one to demonstrate that pneumatic nebulization is destructive for liposomes due to high hydrodynamic stresses associated with liquid atomization. The VM nebulizer was shown to be less damaging for liposomes. The results allow for more rational selection of the atomizing device for delivery of atomized liposomes by inhalation. The aim of this study was to design a multilayer filter structure, improving the economics of aerosols’ separation processes. Three individual various ﬁbrous layers (one of them was a nanolayer) arranged in different configurations were investigated during purification of gas from solid particles. Analysis of changes in their morphology during various stages of the ﬁltration process was used in the selection of optimal filter structure. A multi-nozzle contactor for extraction in the presence of electric field is described. The contactor was tested against the ethanol extraction from a mixture with n-heptane. Ionic liquid [bmim][MeSO4 ] was used as the extraction solvent dispersed electrically. The diameter distribution of generated ionic liquid droplets was measured using the PDA laser system. It was proved that the increasing voltage between the electrodes results in finer droplets distribution and hence in better interfacial area development. Two-phase vertical flow over a tube bundle was examined. To calculate the heat transfer coefficient on tubes’ surface, the electrochemical technique based on heat and mass transfer analogy was used. The Digital Particle Image Velocimetry (DPIV) technique was applied to create velocity fields around tubes. The results obtained using both methods were compared in order to get an overview of velocity distribution around the tube and its influence on heat transfer intensity on its surface. Influence of the initial solution pH, collector concentration and air velocity on the course of Al(III), Cu(II) and Zn(II) ion and precipitate flotation was investigated. The highest values of flotation rate constants for aluminum, copper and zinc were observed for the precipitate flotation when a value of the initial solution pH was about 8. It was concluded that flotation rate constants for investigated metals were proportional to air velocity in the power of about 0.8.
agriculture production was carried out. The calorific value and humidity of biomass were estimated. Effect of biomass humidity on its caloriﬁc value was evaluated for both types of biomass. The membrane chromatography is a separation technique which may be applied in the industrial separation of proteins. Results of lysozyme separation from a hen egg white using ion-exchange membrane adsorbers are presented in the paper. Three variants of stream recirculation were examined and products were tested by electrophoresis. The 87.5% recovery of lysozyme was obtained showing a high purity of ﬁnal product. Kinetics and qualitative aspect of cherry fruit subjected to hybrid drying is considered. Various combinations of convective, microwave and infrared drying methods were applied. The drying test were carried out with the application of different combinations of microwave power 100 W and infrared radiation 240 W with convective drying at air flow velocity 1.7 m/s and air temperature 343 K. The purpose of these studies was to find the most efficient drying method from a point of view of drying kinetics and quality of dried cheery fruit (colour and water activity). Influence of liposomes made of lecithin or lecithin/cholesterol on the dynamic surface tension of model lung surfactant (Survanta) was investigated with the MBP (Maximum Bubble Pressure) method. Liposomes increase surfactant activity, especially in physiological temperature, due to liposome rearrangement and liberation of free lipids which are co-adsorbed at the interface. The results explain mechanisms of interactions between inhaled liposomal drug carriers and the lung surface. Results of whey biodegradation using bacteria strain of B. licheniformis are presented in the paper. The growth kinetics of this strain was developed. The rate of lactose transformation to low lactose concentration is dependent on its content and it could be described as a ﬁrst-order reaction. During biodegradation a decrease in proteins concentration was observed. In this case, the rate of biodegradation was much slower than that for lactose. The paper illustrates the method of multi-phase mixture structure identification based on image analysis with stereological methods. The study was conducted in a rectangular slot channel and in minichannels for vertical cocurrent flow of air − water mixture. The quantitative and qualitative assessment of flow structure was calculated on basis of five specific stereological parameters. These information enable the control of device in which the flow occurs. 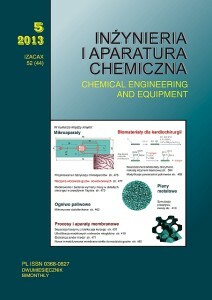 Impact of drying time and technique used on processing, mechanical and rheological properties of polyamides was analyzed in the paper. Commercial polyamide Tarnamid T-27 and Tarnamid T-27 GF30 containing 30% (by weight) glass fibers were dried in a fluid bed dryer and a chamber dryer with forced air circulation. Polymer rheological characteristics (raw granulate) were measured using a plastometer and rotary rheometer. Evaluation of mechanical properties of sample paddles (product) produced in the injection molding process was made. The Young modulus, strength and elongation of samples at breakage were determined in the static tensile and bending tests using a universal testing machine. The impact of drying on the toughness and hardness of polyamide was also evaluated. Creation of a central vortex around the high speed shaft in rotor-stator type system, working as mechanical stirrer in the axis of tank without baffles was studied. Influence of rotor speed and the distance between agitator and tank bottom on the depth of a central vortex in three mixers with various geometric ratios D/d (tank diameter to impeller diameter) was analyzed. Tested medium was distilled water (t = 20 oC) filling each of the examined tanks to the level H = 2D. The relative depth of central vortex increased significantly with the increase of both the rotor speed and the relative distance between agitator and tank bottom. Effectiveness of inhalation therapy may be improved by the application of functional carriers which contain viscosity reducers (mucolytics). Influence of specially designed functional carrier powders on the viscosity and transport rate in the reconstructed bronchial mucus were investigated. The obtained results indicate the simultaneous reduction of mucus viscosity and improvement of mass transfer therefore showing the usefulness of proposed concept of functional carriers in pulmonary drug delivery. Influence of simultaneous change of blades and agitator shaft inclination angle on the floating particles suspension production was studied. During the experimental tests polyethylene granulate was dispersed in water in a mixer without baffles. A turbine agitator with six blades was used in experiments. The results were plotted as classical mixing power characteristics. A significant influence of blades inclination angle and no effect of shaft inclination on the process were found. Investigation results dealing with the heat pump operation with a vertical ground heat exchanger in passive cooling mode of selected rooms in a residential-commercial building in 2012 summer season are presented in the paper. The seasonal, and for each day, daily value of heat pump cooling capacity coefficient was specified. Effect of brine temperature, heat pump operation time and amount of heat received in a cooler on vertical probe cooling power is discussed. discharge. The codes of computational fluid dynamics are helpful in this issue. They enable the quantitative description of non-linear relationships between the time-dependent parameters. Paper presents the first stage of developed modeling strategy, including the use of two-dimensional numerical model of the solid microtubular oxide fuel cell. Codes used in computational fluid dynamics (CFD) allowed a quantitative description of the non-linear relationship between parameters: temperature, pressure, substrate and product streams. ir – oil – water three-phase flow in pipe bends are presented in the paper. As a result of these studies, types of flow patterns formed in pipe tested, flow map and void fractions of phases were determined. The relationship for calculation of void fractions in the gas – liquid – liquid flow in pipe bends is proposed. An enzymatic method for the determination of O2 solubility in perﬂuorodecalin (PFD) and based on the system of two reactions catalysed by oxidoreductases was elaborated. The proposed method enables one to determine the O2 concentration in PFD microliter-scale samples. Volumetric mass transfer coefficients in gas and liquid phases for the PFD-oxygen/air two-phase system were calculated. Visualization of azobenzene spectra and its derivatives using numerical simulation on the NOVA supercomputer was carried out. Data obtained, such as calculating energy of individual excited states, energy stimulation and oscillator strength enabled one to find a position and intensity of bands in UV-Vis spectra. The IR spectra were determined on basis of harmonic vibration frequency. The obtained spectra corresponded quite well with literature data thus offering alternative for the application of traditional methods. Experimental studies on removal of copper(II) from aqueous solutions using a ceramic membrane contactor with 4,13-diaza-18-crown-6 ether as carrier dissolved in 1-decyl-3-methylimidazolium bis(triﬂuoromethylsulfonyl)amide [C10MIM][NTF2 ] were carried out. The inﬂuence of temperature gradient and external phase pH on mass-transfer rate of Cu2+ was experimentally investigated. It was found that the addition of 50% (v/v) of tributyl phosphate (TBP) to [C10MIM][NTF2 ] insigniﬁcantly decreased the distribution ratio. A comparison of experimental results with theoretical data of volumetric liquid-side mass transfer coefficients in gas − liquid Taylor flow in a microchannel is presented in the paper. The experimental values of k L a were obtained based on Danckwerts’ method. Theoretical data were calculated using Ansys Fluent 14.0 software. Theoretical and experimental values of kL a are quite closed. The obtained theoretical results are also conﬁrmed by literature data dealing with Taylor flow modeling. Results of experimental investigations of the application of direct laser prototyping method (DLP) in the process of manufacturing lab-on-a-chip systems are presented in the paper. The effects of laser beam power, speed of laser head and engraving resolution on the quality of resulting structures were analyzed. Thanks to the use of DLP technique, it is possible to shorten the manufacturing time of microsystems from dozens of hours to a few minutes and to reduce costs of system design and fabrication. The paper presents a new method for the designing of lab-on-a-chip (LOC) microdevices for biotechnology and medicine applications. It makes possible to reproduce the vascular structure, regardless of the organ, tumor or even the body. Methods for designing and fabrication of microsystems for microflow investigations in the network of capillary vessels of cancer tumor were developed. The complete methodology for fabrication and joining of the system is presented. analyzed and the main mass-transport resistances, caused by membrane active layer, R M and fouling, R F were identified. A 2D network model was used to design the optimal structure of fibrous filter. It enables the efficient capture of particles, creates the lowest pressure drop and guarantees a long time usage. The individual layers were joined at three different configurations. A case of non-woven uniform monolayer with average performance was also examined. The deposition efficiency for particles diameter between 1÷10 μm was calculated. Results clearly indicate that combining layers with different porosities and especially their layering sequence has a major effect on deposition ratios inside the filter structure. Models of diffusion and reaction process in a pellet with the slab geometry valid for case with or without a dead zone are introduced. Published earlier and newly developed analytical solutions of the considered problem are analyzed and discussed for a full range of model parameter changes, taking into account a dead zone and multiple steady-states regions. A complete and coherent description of catalyst pellet behavior is presented. In this paper the authors’ own SLM membrane is presented. For the purpose of this work a new immobilized membrane was prepared using a microporous polypropylene membrane and silicone oil. A new method for obtaining such membrane modules was developed. Tests were conducted using such gases as O2 , N2 and CO2 . The obtained results indicate that this type of membrane is characterized by large permeability factors but also by quite small separation factors. Conditions for the application of two- and three-phase fluidized bed bioreactors in aerobic processes are presented in the paper. A method for the determination of recirculation ratio boundary values, substrate conversion degree and mean residence time of liquid in the installation is proposed. The presented method has a general nature and may be used for any aerobic process. The improvement of sunflower oils degumming process was analyzed in the paper. The electromagnetic field treatment was applied for degumming of sunﬂower oil with high phosphorus content. The new method of degumming compared with the standard water degumming reveals the following advantages: reduction of process duration time and improvement of final product quality. The aim of this work was to create a clot-resisting coating on a surface of polymer used in the construction of artificial cardiovascular implants. This was achieved by an innovative use of phosphatidylcholine − a substance which naturally occurs in human body and forms a main component of cell membranes. The fabricated coating was proved to possess good antithrombogenic properties and thus can be possibly used in construction of cardiovascular implants. Results of experimental investigations of two-phase air − water mixture flow in horizontal quadratic minichannels with the hydraulic diameter from 2 to 6 mm are presented in the paper. The measured values were compared with calculated ones using the Lockhart-Martinelli and Chisholm methods. Accuracy of calculations with the standard deviation about 40% is close that obtained in conventional channels. Investigations dealing with active carbons obtained from vegetable precursors (activated carbon dust from charcoal activated by water vapour, activated carbon from peach stones obtained by their carbonization and activation using carbon dioxide, and finally commercial activated carbon produced from coconut shells activated by water vapour) additionally modified by KOH were carried out. As a result of this activation the sorptive material with significantly developed micro- and mesoporous structure and modified surface was obtained. The activation resulted in significant improvement of methanol sorption properties. The obtained carbon adsorbent can be advantageously used for heat storage purposes. A system with fixed matrix regenerator with an innovative packing shape used for waste heat recovery and working integrally with an open hearth glass furnace is presented in the paper. Based on the experimental data, it was shown how to determine the experimental effectiveness of regenerators for a real working object. Experimental results dealing with the effectiveness of regenerators tested and performed for the heating and cooling periods with the corresponding measured uncertainties are presented. The goal of this work was the identification of liquid flow in a tubular reactor with a different width of baffles on basis of CFD simulations and Laser Doppler Anemometry (LDA) measurements. The results obtained can be used in practice during designing and optimisation of tubular reactors applied in coagulation and flocculation of colloids and solid particles of arduous settling suspensions in environmental protection and water treatment processes. The aim of this work was to fabricate a novel material based on polyurethane coated with human endothelial cells. To promote endothelial cells adhesion, the surface of polyurethane was grafted with collagen in a 3-step chemical procedure. The procedure can be characterized as promising and simple. Endothelial cells anchored and proliferated on obtained materials confirmed the effectiveness of the proposed method of collagen grafting.